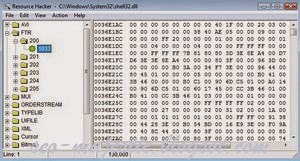 Resource Hacker is a small but very powerful programme for editing executable resources in 32 bit Windows. Resource Hacker allows for watching, editing, renaming, adding, eliminating and extracting executable resources from programmes for 32 bit Windows. This programme allows for maximum customisation of any kind of programme, DLL library, etc. includes its own script compiler and decompiler that makes much easier the work the users have to do. With Resource Hacker it is possible to change all images of a programme, menus, cursors, the real icon of the programme, data about the version, the messages the programme shows, the dialogue boxes and even some aspects of the programme’s behaviour. Resource Hacker has a simple interface, a tree view mode has all the resources of a specific programme, to the right its respective scripts, data, menus, etc. The programme automatically shows the script for each component and also the graphic window it generates, allowing for resizing, eliminating unnecessary parts, changing texts, etc. Resource Hacker allows also for modifying forms, changing videos, animated gifs or even add them if the user feels it necessary. For more security, the file creates automatically security copies of the edited files allowing for restoring to a previous state in case of making an unwanted modification or making a mistake.